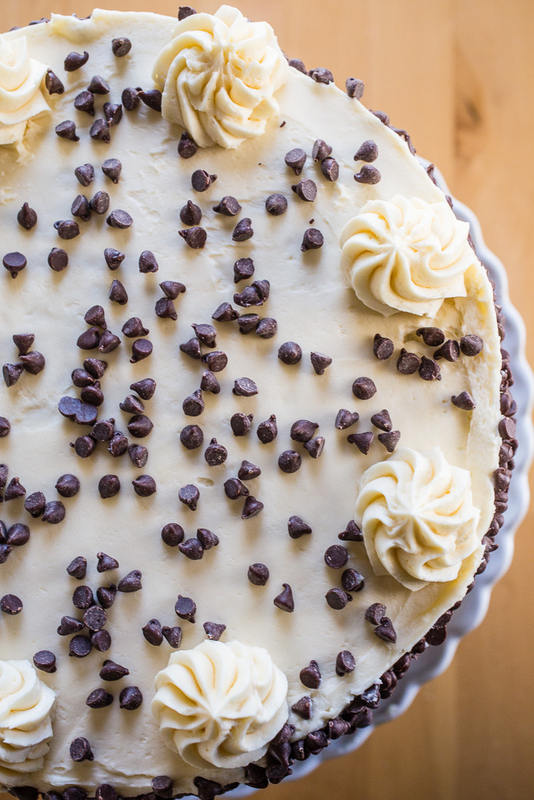 This homemade Italian cannoli cake recipe is a doozy! Homemade cannoli filling sandwiched between rum-soaked yellow butter cake layers with whipped vanilla buttercream frosting and loads of mini chocolate chips. I can’t even! So I’ve got a funny story – and a long one so bear with me – to go along with this cannoli cake. This is the cannoli cake that wasn’t supposed to be. We celebrated dad’s 82nd birthday last month and after a few health issues over the past three years – for him, me, and my eldest brother – this celebration is one that I looked forward to for a while. A week before our planned party, dad told me he wanted a caramel cake and of course, all sorts of sweet confections with drippy salted caramel sauce darted through my brain. After a few days of searching for the *perfect* recipe, I started to wonder if he meant a Southern caramel cake. You know: the one in which “The Help” hysterically repopularized some years ago. Dad had spent some time in the 50s playing professional baseball (the “minors” before they were called such) throughout many of the Southern states and I thought that maybe this was the type of caramel cake he was thinking about. So. The day before his party, I decided to check. After all, no one deserves to be disappointed with their birthday cake, amiright? And you know what he told me when I asked about his cake choice again? “Uhh…that Italian cake. Ganol!” Cannoli cake. Because, well, you can take the boy out of the Bronx and all that stuff. 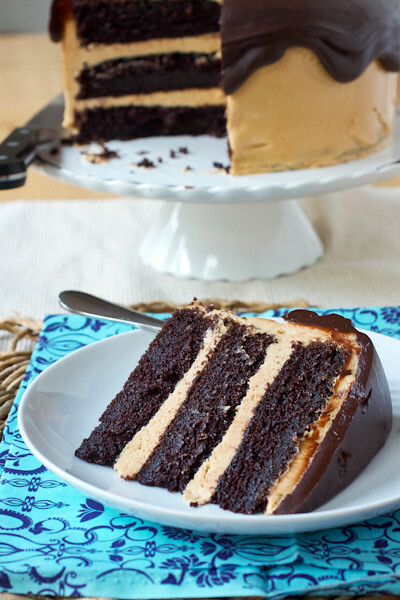 Southern caramel cake? Psshh! Let me tell you though: I switched gears pretty easily here. Anything having to do with cannoli I can get behind 100%! For this creation, I decided to go with my favorite yellow butter cake which I brushed with rum when the layers were fresh from the oven. I think a sponge cake would have been great too but I went with the vanilla cake. I then sandwiched a homemade cannoli cream filling between the cooled layers and covered the cake with whipped vanilla buttercream frosting. 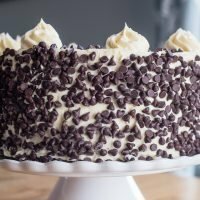 The finishing touch – and quite possibly my favorite thing to do with a cake – involved smacking handfuls of mini chocolate chips onto the buttercream. Talk about a stress reliever! I didn’t get any photos of the slices since it’s a leeeetle impolite to cut into a birthday cake which isn’t your own but trust me here: this is an impressive cake. Cannoli is a crispy pastry shell that is filled with a thick ricotta cheese mixture. The filling is usually flavored with a little Marsala wine, cinnamon, and orange zest. Cannoli is one of the most classic Italian desserts and people usually go nuts for them when they show up on dessert platters! The pastry shells for cannoli are usually fried but they can also be baked too, like for these cannoli bites. The pastry dough is rolled into a very thin layer and then cut into circles. You’ll wrap the circles around pastry tubes and then the tubes are gently dropped into a fryer. After a couple of minutes, the pastry shells up and turns light brown in color. The cooked shells are drained and then the pastry tubes are slipped off of the shells. 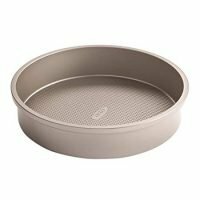 This leaves the perfect hole to fill with cannoli cream! What is Cannoli Filling Made of? The base of a cannoli filling is sweetened ricotta cheese. The cheese is strained of most of its liquid so it thickens enough to be piped into a crispy pastry shell. Marsala wine, cinnamon, and orange zest are common flavors in cannoli filling. The filling is sweetened with powdered sugar (confectioners sugar) and vanilla extract. Some bakers mix mini chocolate chips or chopped pistachios into the filling to give it a little texture. 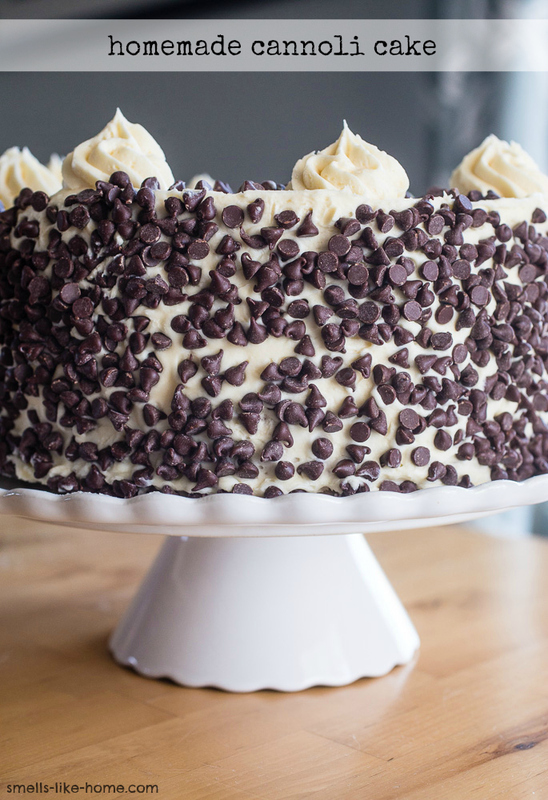 The cannoli filling for this cake is just perfect! 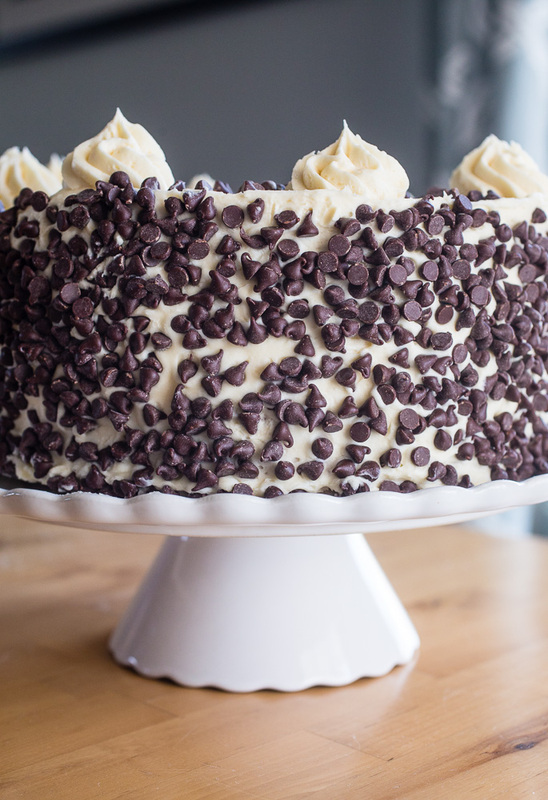 It’s rich, sweet, and creamy with mini chocolate chips studded throughout. 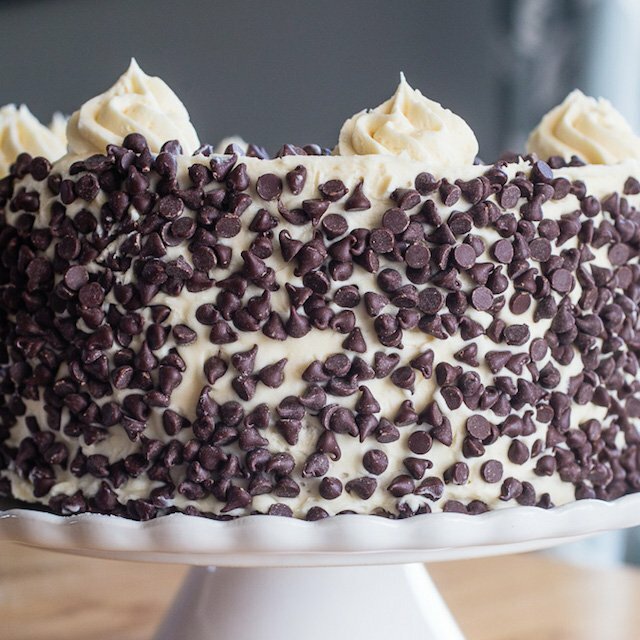 And not only does the whipped vanilla buttercream frosting hold up really well to a windfall of chocolate chips, but it’s not overly sweet and complements the other cake components flawlessly. Dad TOTALLY flipped out over this cake, showing it off to everyone like a proud papa. And after he whiffed at blowing out the candles his first two tries (hello COPD), he happily sliced the first piece and then devoured it like it was his job. And basically? It when it’s your birthday cake, that IS your job! 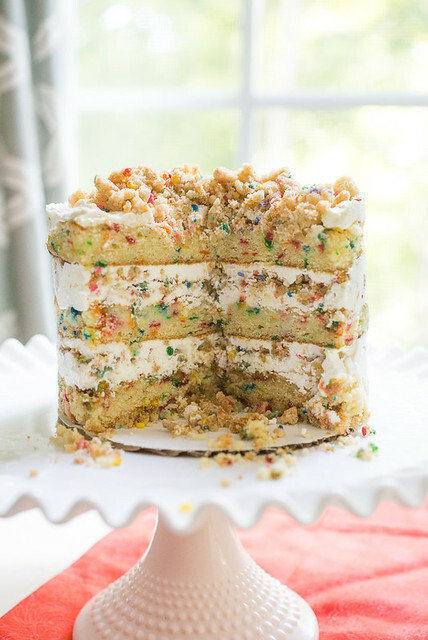 Are you looking more birthday cake inspiration? Check out these recipes! 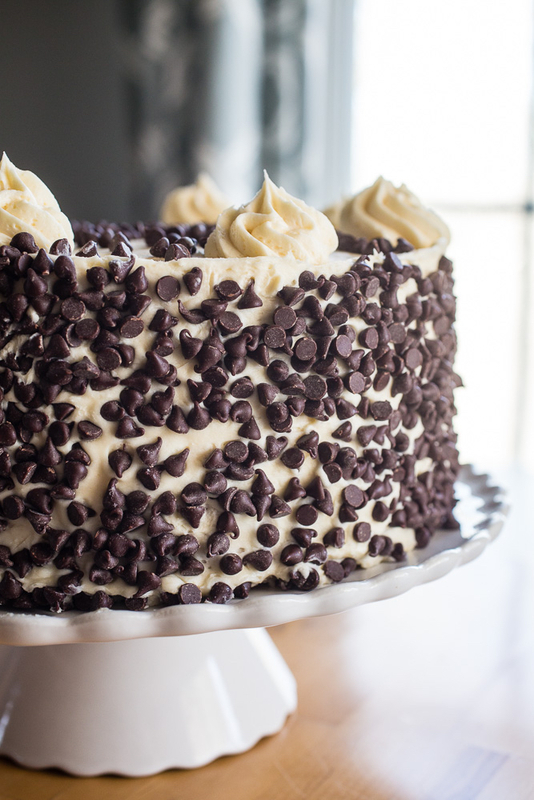 This homemade cannoli cake is a doozy! Homemade cannoli filling sandwiched between rum-soaked yellow butter cake layers with whipped vanilla buttercream frosting and loads of mini chocolate chips. To make the cannoli filling: The night before you plan to assemble the cake, drain the ricotta cheese in a fine mesh strainer lined with cheesecloth or a coffee filter. Set the strainer over a bowl and allow the ricotta to drain in the refrigerator at least 12 hours. The next day, transfer the ricotta to a medium mixing bowl; discard the drained liquid. Mix in the remaining ingredients into the ricotta, folding in the chocolate chips last. Refrigerate until ready to use. 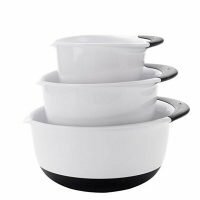 To make the cake: Center one of the oven racks and preheat the oven to 350° F. Grease the bottom and sides of two 9-inch round cake pans with butter. Line the bottom of each pan with a round of parchment paper cut to fit the pan. Flour the sides of the pans, tapping out the excess flour; set the pans aside. In a large bowl, whisk the flour, baking powder, and salt together; set aside. 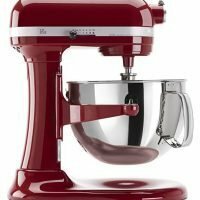 In the bowl of a stand mixer fitted with a paddle attachment, cream the butter and sugar on medium-high speed for about 4 minutes, until the mixture is light and fluffy. Scrape down the sides and bottom of the bowl. Add the eggs, one at a time, beating to incorporate before adding the next and scraping the bowl as needed. Mix in the vanilla. With the mixer on low speed, add half of the dry ingredients, then all of the milk, then the remainder of the dry ingredients, mixing to just about fully incorporate each before adding the next. Scrape the bowl well to incorporate anything that may be stuck to the bottom of the bowl. Divide the batter evenly between the two prepared pans (a kitchen scale works great for this). Smooth out the tops with an offset spatula. Bake for 30 to 35 minutes, rotating the pans halfway through the baking time, until the cakes are a light golden brown and a toothpick comes out clean when inserted into the centers. Transfer the pans to a wire rack and immediately brush the tops with the rum. Allow the cakes to cool for 10 minutes then run a sharp knife around the edge of pans and transfer the cakes to the wire rack. Allow the cakes to cool completely before assembling. 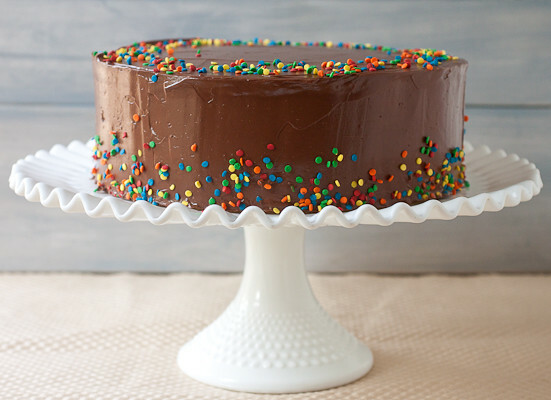 To assemble: Smear a small dollop of the frosting on a 10-inch round cake board or cake plate. Center one of the cake layers atop the cake board or plate. Spread the cold cannoli filling evenly over the cake. Set the second layer atop the cannoli filling. Frost the top and sides of the cake leaving enough frosting to pipe swirls on the top of the cake if you'd like. I used an Ateco 828 pastry tip but a Wilton 3M will work too - it's just a little smaller. Take a small handful of chocolate chips in your hand and shake them into an even layer with your hand flat (palm up). Position your hand close to the side of the cake and quickly flip the chips onto the side of the cake, pressing them lightly when your hand lands on the frosting. Work your way around the sides of the cake with the chips. Fill in any major gaps with more chips. Pipe swirls around the top edge of the cake and sprinkle the top some remaining chocolate chips. Be sure to plan ahead for this cake. The cannoli filling will need an 12hr (or overnight) stint in the fridge to allow the ricotta cheese to drain. You want a really thick and dry ricotta cheese for the filling so don't skip this step. holyyy CANNOLI! (:P) I love love love everything about this cake!! I know – giving up on the caramel cake wasn’t easy but….this cannoli cake wasn’t too much trouble to wrap my brain around. lol Thanks for your sweet comment, Kayle! Does this need to be refrigerated after assembly or can I leave it for a bit? Could an orange liqueur be used in place of the rum? 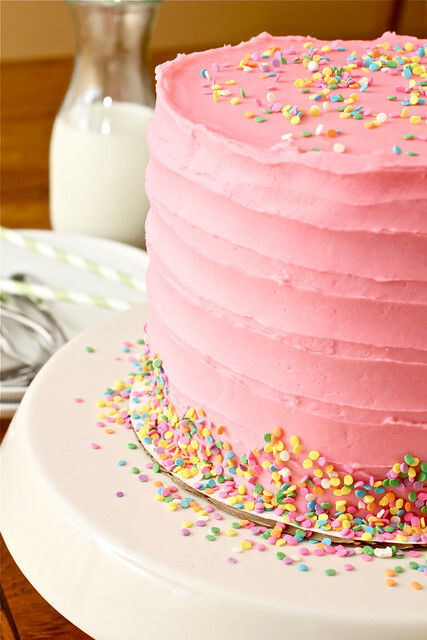 I want to make this for my sisters birthday on the 21st, her favorite color is pink, am I able to color the frosting? Hi Tiffany! Yes, you can absolutely color this frosting. It’s a vanilla buttercream so it will hold up well to coloring. Let me know what you and your sister think of the cake. Happy birthday to her!